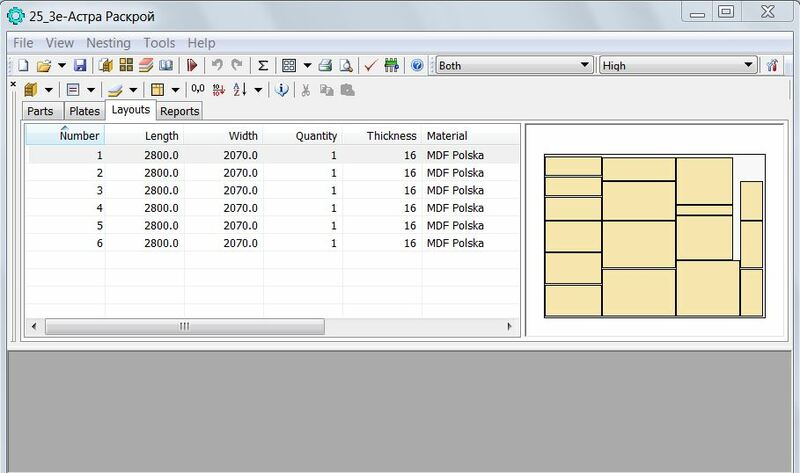 Once you have created an order and performed nesting, the list of layouts will show up. However, you have only created one layout in Lesson 1 - How to start working with Astra R-Nesting? Open this layout for editing by double-clicking it with the left mouse button. A new window - Layouts clipboard - will appear to the right of the layout. The top part of this window contains the list of unnested parts. Part selection. Left click on any part, then press and hold the Shift key while clicking other parts. A second click on an already selected part will deselect it. To deselect all parts in the layout, click anywhere in the unused area of the layout. Parts can also be selected with a selection box. To do that, left click anywhere on the layout and move the cursor while holding down the mouse key to create a selection box. All the parts that fully or partially appear within the selection box will be selected. Moving parts on the layout. Left click and hold the key on any part, then move the part to the desired location. Note - when parts are moved , their position is automatically checked. If the parts being moved overlap with each other, the mouse cursor will look like that: . When you drop the part onto the layout, it will be automatically shifted to the limit stop in the direction of the base point of the layout. Overlapping, shifting to the base point and other parameters are configured in the Control - Default actions section of the Options dialog. Moving parts to the layouts clipboard. Select several top parts with a selection box and use your mouse to move them to the Layouts clipboard. You can also move parts between layouts in the same manner. Part rotation. You can only rotate the parts with the "rotate" option enabled. These parts are marked by diagonal shading. Select the parts you need to rotate, right click on one of the selected parts and run the Rotate command from the context menu. Lesson 1 - How to start working with Astra R-Nesting?